Tour first day in Montreal was mostly spent walking around the city. By the river side (near the old town) we found a colony of 100+ Cliff Swallows which flew around the quay right in front of us. With them was a single Tree Swallow. Also around the river was one male Red-winged Blackbird and a few Chimney Swifts. 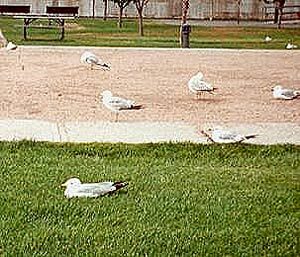 In this area, flying around and on the grass, were about 100 Ring-billed Gulls.